Heat the olive oil in a large pan over medium heat. Add the onion, garlic, and carrot and cook until soft. Stir in the corn, lentils, vegetable stock, and tomato paste, Simmer, stirring occasionally, for about 15 minutes, or until thickened. Place the potatoes and cauliflower in a large pot and cover with water. Bring to a boil over medium-high heat, and cook until soft. Drain and add them back to the pot. Mash with a potato masher, stir in the milk, and season to taste with salt and pepper. Prepare an 8-inch square baking dish by coating the bottom with coconut oil or extra-virgin olive oil. Pour in the vegetable filling and smooth it out. 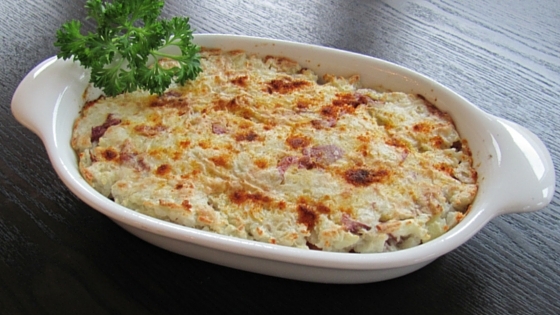 Top with the mashed potatoes/cauliflower mixture, evening spreading it out, and place under the warm broiler until the top is brown and crisp. Cooking Tip: To cook lentils, place in a saucepan, cover with at least 1 inch of water, bring to a simmer and cook until just tender, 15 to 30 minutes, depending on the type of lentil. Drain and rinse with cold water. 1 cup dry lentils = about 2 1/2 cups cooked.